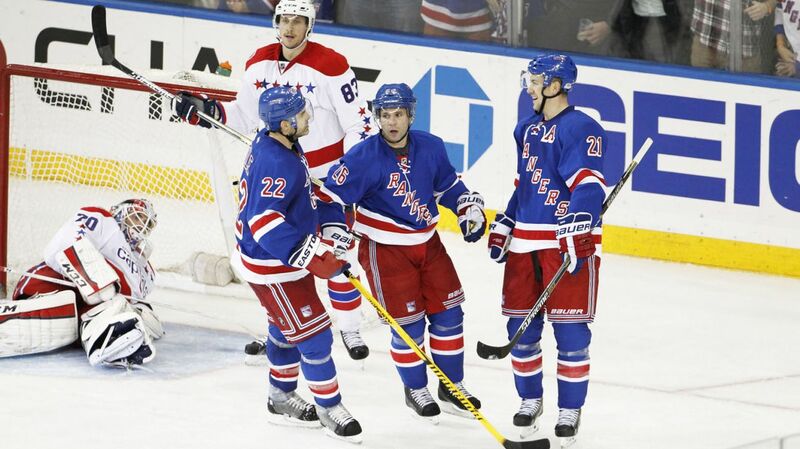 The Rangers were victorious in round one, and now face off against the Washington Capitals. Here is what they need to do to win. Photo courtesy of MSG Photos. In the first round of the playoffs, the Rangers were able to execute their game plan and eliminate the Penguins in five games, advancing to the second round of the playoffs to take on the Washington Capitals, emerging victorious following a grueling seven game series against the New York Islanders. Unlike the Penguins, the Capitals are a fully healthy team, with all of their wingers and defensemen ready to play. They too have a solid goalie in net in Braden Holtby, a name familiar to the Rangers and their fans in the postseason. Following the tiring series against the Islanders, with little rest as well as travel, the Capitals are coming into what will be another extremely hard fought series against another very good team in the New York Rangers. With Game 1 and 2 at Madison Square Garden, the Rangers have another good opportunity to pounce on what could be a tired Capitals team as they try to reach the Eastern Conference Final for the second time in as many seasons. This is what the Rangers need to do in order to defeat the Washington Capitals. The defensive effort from guys like Dan Girardi and Ryan McDonagh will be very important in limiting the effectiveness of the Capitals top line. Photo courtesy of MSG Photos. Just like the series against Pittsburgh, this is an obvious goal. In the first round, the Rangers really did a good job of limiting Sidney Crosby and Evgeni Malkin’s effectiveness on offense. In fact, the only game the Penguins won was when Crosby scored two goals, his only goals of the series. Also like the Penguins, the Capitals don’t have a tremendous amount of depth on offense, relying on their superstars to carry their production. Alex Ovechkin is the best pure scorer in the entire league, and Nicklas Backstrom is a tremendous passer with a surprising wrist shot. Past those two, there isn’t a lot of talent or depth in the forwards that help their offense. 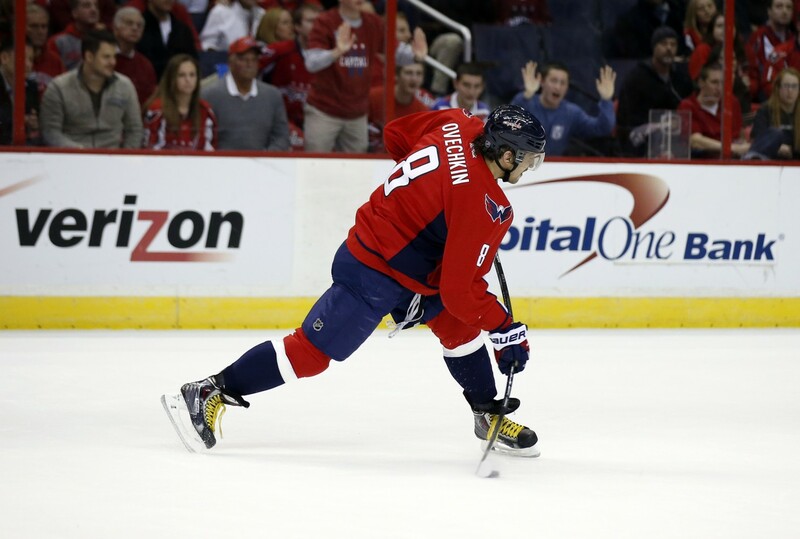 Evgeny Kuznetsov is growing into a quality player, with three goals in the first round. Joel Ward is a strong presence along the boards, and Marcus Johansson was a 20 goal scorer during the regular season, but after that, the Capitals are a bit thin when it comes to depth forwards. During the games during the regular season, Alain Vigneault regularly puts the defensive pairing of Ryan McDonagh and Dan Girardi on the ice when the Capitals top line of Ovechkin, Backstrom and Ward on the ice. If McDonagh and Girardi just came off a shift, then Vigneault could throw Staal and Klein on the ice, two more defensively responsible players. The Rangers have done a good job against Ovechkin in the season series, limiting him to just one even strength goal in the four games. If they can do the same in the playoffs, as well as control Backstrom, you eliminate a big part of the Capitals’ offensive game. Ovechkin’s patented one timer from the left faceoff circle on the power play is something that the Rangers will need to prevent throughout the second round. Photo courtesy of Alex Brandon/Associated Press. This will be the difference maker in the series between the Rangers and Capitals. Washington finished first in the league on the power play at the end of the season, scoring on 60 of their 237 opportunities for a 25.3% conversion rate. During last round, they were 2 for 13 (15.4%). Against the Rangers, the Capitals went 4-13 on the power play, with all of the goals scored by Alex Ovechkin. Ovechkin led the capitals, and the NHL, with 25 power play goals this season. While there are certainly other players who can score on the man advantage, the next five players after Ovechkin combined for 24 goals. Needless to say, stopping the “Great Eight” on the man advantage is extremely important. Ovechkin likes to hang around the left faceoff circle, usually looking for a one-timer. He usually remains there when the puck isn’t on that side of the ice, waiting for the puck to come for him. In an article by Adam Herman from blueshirtbanter.com, his solution is to stick a forward on Ovechkin and turn it into a tringle plus one penalty kill. Putting a strong, speedy, and defensively capable forward like Rick Nash on Ovechkin will force him to move around, and get him away from those danger areas. While this creates a four on three power play essentially, it’s the lesser of two evils. Eliminating Ovechkin from the power play gives them a better chance of killing off the penalty. No matter how they do it, stopping the Capitals’ on the man advantage is extremely important to winning the series. The Blueshirts should try and take advantage of Braden Holtby’s tired legs and make him move laterally, capitalizing on his tendency to overchallenge move a lot in the crease. Photo courtesy of MSG Photos. I discussed this in my series preview yesterday, as this was a topic discussed by MSG Analyst Steve Valiquette. While Holtby has had a really good season, and he fared well against the Islanders in the series, he’s beginning to show signs of fatigue. Playing in 73 games in the regular season and another six in the playoffs will do that to you. Some of the goals given up by Holtby lately are signs of that fatigue, both mental and physical errors. John Tavares’ overtime goal in Game 3 showed Holtby misplaying an initial shot, and not being able to move over to the far post in time to cover Taveres’ shot. The goal in Game 7 was a harmless shot from Frans Nielson that somehow trickled through his legs. The signs of fatigue are there. The Rangers just need to start taking advantage of it. The key to tiring out Holtby early in the series is to get him moving laterally. Steve Valiquette pointed out that Holtby tends to over-challenge a lot. In a situation where most goalies would be near the post, Holtby will be moving around the crease, staying at the very top of the paint, and then retreating at times. This is dangerous, as it leaves him exposed for rebounds and cross passes, because he has to move so much to cover the far post. By using lateral passing, the Rangers will get Holtby moving even more, tiring out his legs quickly, and making it tougher for him to get back and cover posts, or make those moving side to side passes. With Martin St. Louis on the top line in place of the injured Mats Zuccarello, expect St. Louis to try and connect with Nash on some cross-ice passes for tap in attempts. I also think we will be seeing a lot more St. Louis one-timers off of feeds from Brassard and the defensemen, mainly due to Holtby’s struggles when it comes to side to side movement. Holtby has been working hard. In the first round series, 40% of the shots he faced were high quality shots, compared to the 20% that Lundqvist faced against Pittsburgh. 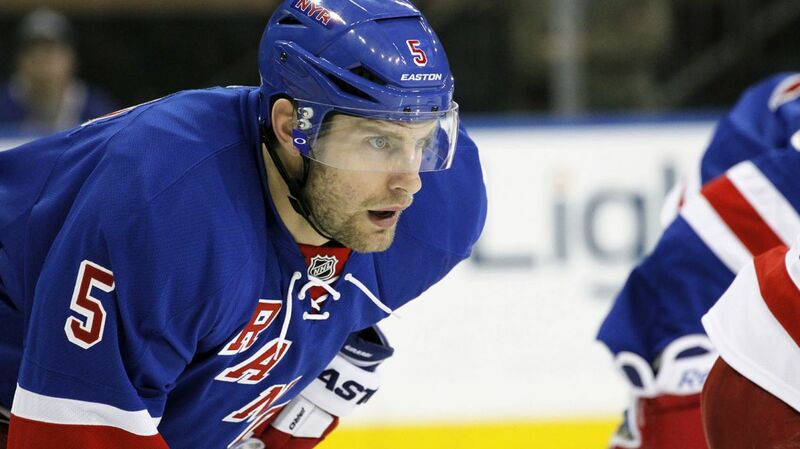 He’s played in a total of 79 games this season, compared to just 51 from Henrik Lundqvist. Get him moving laterally, tire him early, and score some goals. The Rangers will need guys like Chris Kreider to take advantage of the open ice during this series, using speed to create high quality scoring chances down the wings and on breakouts. Photo courtesy of MSG Photos. The Capitals aren’t the most skilled team in the playoffs, or the fastest team, but they are one of the biggest and most physical teams in the playoffs. The Capitals regularly like to hit everything in sight, trying to take opponents out of the game with their physicality, bone crunching hits, and generally just getting under the opponents’ skin. In the past, this style of play hasn’t seemed to annoy or deter the Rangers. 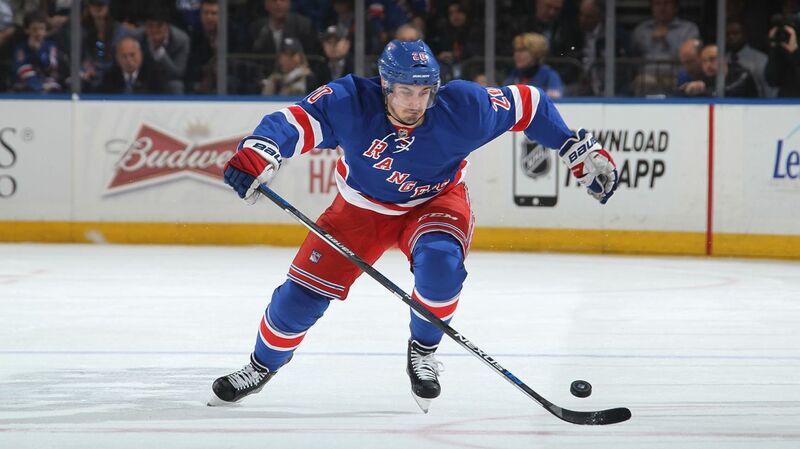 Vigneault’s system has the ability to counter size and physicality, especially with the speed that the Rangers have. Because the Penguins were so depleted on defense, they focused heavily on eliminating the speed and transition game of the Rangers. Because of that, the games were limited to around 25 shots or less per game from each team. The Capitals are healthy and pretty deep on defense, so I think the ice will definitely open up a bit more in this series. As already said, the Capitals are not the fastest team, so the Rangers will have an opportunity to use that transition game that suits them so well. If the Rangers can effectively use their outlet passes from the defensive zone to break out on offense, and use speed from guys like Carl Hagelin and Chris Kreider down the wings, the Rangers can create high quality chances against a fatigued Braden Holtby. This is the same as last series. The Rangers success during the regular season gave them home ice advantage throughout the playoffs. They’re taking on a tired Washington Capitals team coming out of a tiring series full of hitting and chippy play, with just two days of rest and travel. The Rangers have had nearly a full week of rest and practice. The odds are in the Rangers favor. Come out fast, score the first goal, and win Game 1. Please follow @The_RangerZone on Twitter for breaking news, updates, links to articles, and interaction with me and the blog. Posted on April 30, 2015, in In the Crease and tagged Alain Vigneault, Alex Ovechkin, Braden Holtby, Cam Talbot, Carl Hagelin, Chris Bourque, Chris Kreider, Dan Boyle, Dan Girardi, Derek Stepan, Derick Brassard, Dominic Moore, Hartford Wolf Pack, Henrik Lundqvist, James Sheppard, Jesper Fast, JT Miller, Keith Yandle, Kevin Hayes, Kevin Klein, King Henrik, Madison Square Garden, Marc Staal, Martin St. Louis, Mats Zuccarello, Matt Hunwick, MSG, MSL, New York Rangers, NHL, NHL 2014-2015 Season, NHL Playoffs, Nicklas Backstrom, NY Rangers, NYR, Rangers, Rangers Nation, Rangerstown, Rick Nash, Ryan McDonagh, Stanley Cup Playoffs, Tanner Glass, The Ranger Zone, Washington Capitals. Bookmark the permalink. Leave a comment.